. When you delegate contact management, you give someone else the ability to edit or delete information in your personal contacts folder on your behalf. Any changes they make to those contacts will update in your Contacts. Customers will often use delegated contacts so administrative assistants can manage contacts for executives. This feature was previously available in old Contacts, but not in new Contacts (see below for more). If you use delegation in old Contacts, the delegation will still be active if you move to new Contacts. Contacts and contact delegation are no longer available through Gmail. You can invite someone else within your organization to manage your contacts through the new Contacts website at contacts.google.com. Once you’ve delegated access, the person you delegated to will be notified by email and will be able to add, edit, and delete contacts on your behalf. To see and change delegate access to your contacts, click on the Delegate access button in the product’s main navigation menu. See our Help Center to learn more about how to delegate your contacts. When someone delegates their contacts to you, you’ll get an email asking if you want to accept the request. If you accept, the contacts will appear in a new “Delegated contacts” section of the Contacts menu. You can add, edit, and delete someone else’s contacts the same way you can with your other contacts. If you want to stop managing these contacts, click Remove delegated contacts at the top of the page. See our Help Center to learn more about managing delegated contacts. If you haven’t already, you can launch new Contacts for your users. New Contacts (aka Contacts preview) was launched in 2015 and has many comparable features from old Contacts, with an updated interface and additional features that increase efficiency. If you’ve previously enabled new Contacts and a user has opted out, they can opt back in by looking for the link to “Try Contacts preview” in the left hand menu at contacts.google.com. We’re adding the ability to delegate contact management to someone else in new Google Contacts (aka Contacts preview). When you delegate contact management, you give someone else the ability to edit or delete information in your personal contacts folder on your behalf. Any changes they make to those contacts will update in your Contacts. Customers will often use delegated contacts so administrative assistants can manage contacts for executives. Monitor the G Suite Updates blog to learn about these replacements when they launch. Note that we’ll continue to support these features for at least 12 months after their replacements become available. To see emails from different accounts at one time, simply select the “All Inboxes” view from the left-hand side drawer. This will show all your emails in a single list, but don’t worry—no emails will be shared between your accounts. 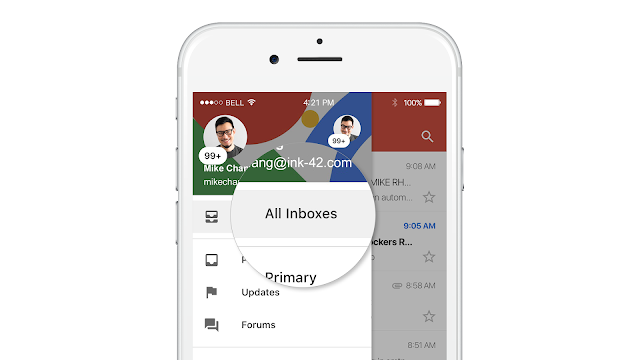 You can view email from multiple accounts, be it your work or personal, G Suite or non-G Suite (even third-party IMAP accounts), in the Gmail iOS app. But you’ve traditionally needed to toggle between different inboxes to do so. To save you time, we’re now making it possible to view emails from multiple accounts in a single inbox on an iOS device—the same way you can with the Gmail Android app. Customers with G Suite Business, Enterprise, and Education editions, as well as Cloud Identity Premium, can enable user auto-provisioning in all supported applications. Customers with G Suite Basic, Government, and Nonprofit editions can configure auto-provisioning for up to three applications from the supported list. For more information on how to set up auto-provisioning, check out the Help Center. When auto-provisioning is enabled for a supported third-party application, any users created, modified, or deleted in G Suite are automatically added, edited, or deleted in the third-party application as well. This feature is highly popular with admins, as it removes the overhead of managing users across multiple third-party SaaS applications.
. The options and settings available won’t change, but we hope the new interface makes it easier to find data and collaborate more effectively. See our Help Center for more information on how to see the view history of your Google Docs, Sheets and Slides. 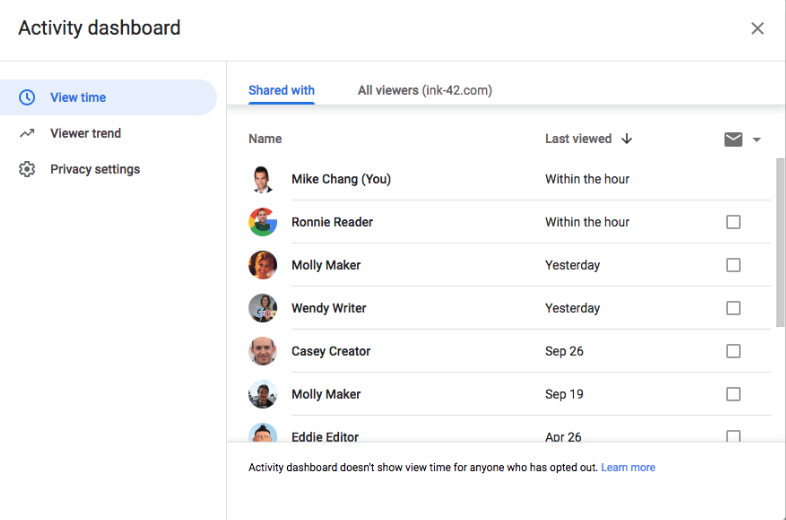 We’re updating the interface of Activity dashboard in the Google Docs editors. The options and settings available won’t change, but we hope the new interface makes it easier to find data and collaborate more effectively. Last year, we introduced a new resource for admins: What’s new in G Suite? Don’t forget to visit the page regularly for a list of the most recent launches across G Suite. Following our previous announcement that we’ve moved Jamboard fleet management to the G Suite Admin console, these logs will be in the G Suite Admin console at Home > Reporting > Audit. Diagnose issues: For example, if a Jamboard is offline, an admin can review the logs to see when it went offline and see when the device was last rebooted. This can help you narrow down and fix the possible cause of the connectivity issues more quickly. Save time: For example, if a Jamboard user reports an unhelpful change or is experiencing an issue, admins will be able to see when recent on-device settings were changed. This could help narrow down the issue and track admin actions taken for the board, which helps avoid duplicating any steps that have already been tried. See our Help Center for more information on how to manage Jamboards. We’re adding new Jamboard logs to the Admin console. These will give G Suite admins better visibility into the status of their Jamboards, as well as what actions have been taken on them. We hope this will help you better manage your fleet of Jamboards and better diagnose and fix any issues you have with them. the room insights dashboard in the Admin console. 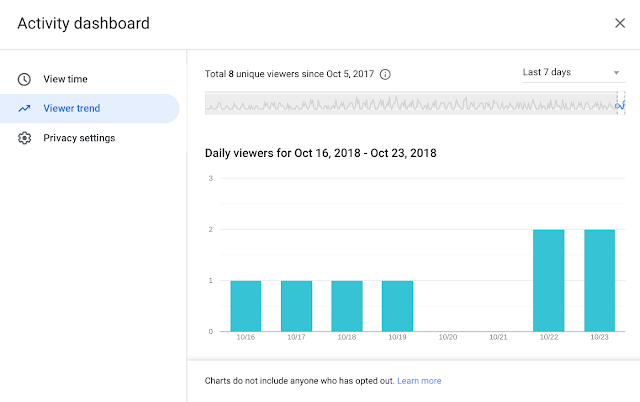 As a G Suite admin, you can use this dashboard to better understand how meeting resources are being used within your organization. We’ve heard from you that you’d like to export this helpful information in order to further analyze it. That’s why we’re now adding an option for you to export the raw data for your selected rooms and timeframe from the dashboard as a CSV file. Check out the Help Center for more information on how your meeting rooms are used. In August of this year, we announced the room insights dashboard in the Admin console. 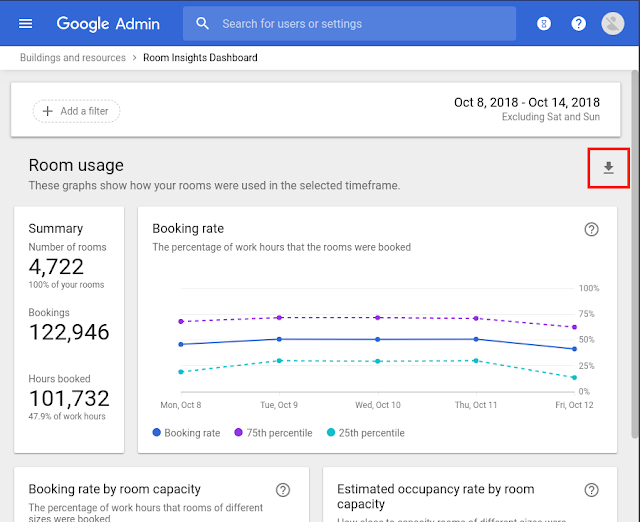 As a G Suite admin, you can use this dashboard to better understand how meeting resources are being used within your organization. and security keys within our native MacOS and Windows apps. These authentication options were previously only available for Chat on the web. With SSO, employees can use the same, easy sign-in process for Chat that they use to access all of their enterprise cloud applications after signing in just one time. For admins who have required that their users have 2-step verification enabled, this requirement will now apply to Chat desktop apps as well. We’re improving the Hangouts Chat sign in process to support using Single-Sign-On (SSO) and security keys within our native MacOS and Windows apps. These authentication options were previously only available for Chat on the web. , Dropbox, Atlassian’s Jira, and Egnyte to any Gmail message—right as you’re drafting it. We’re launching Compose actions to G Suite customers today with those four partners (plus more on the way). See our post on the G Suite blog for more details. Gmail Add-ons with compose actions can be installed from the G Suite Marketplace. Like all other Gmail Add-ons, G Suite admins can install them for their entire domain or add them to their whitelist. Compose actions in Gmail Add-ons make it easy to add links and attachments from apps like Box, Dropbox, Atlassian’s Jira, and Egnyte to any Gmail message—right as you’re drafting it. We’re launching Compose actions to G Suite customers today with those four partners (plus more on the way). See our post on the G Suite blog for more details. This add-in is the Meet equivalent to the previous Hangouts Outlook plugin. Check out our Help Center to learn more about adding Meet video meetings to Outlook events, including instructions for downloading the add-in. 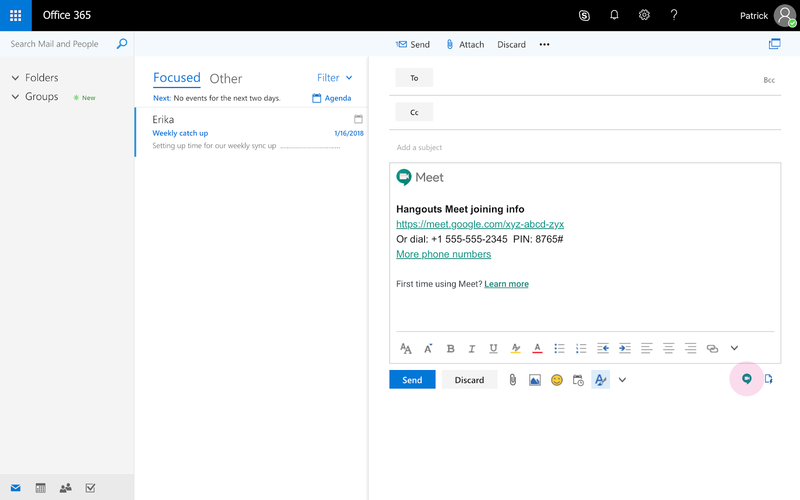 We’ve built a Hangouts Meet add-in for Microsoft Outlook to help Outlook users schedule Meet meetings. This add-in allows you to create a new Meet video meeting in your Outlook event or email. Simply install the add-in, and tap on the Meet icon to automatically insert video conferencing details and info on how to join the Calendar event or email. When you’re using a table, you’ll see your table structure highlighted in a vertical ruler on the left side of the screen. The vertical ruler matches the horizontal ruler, which already exists and is a popular way to control cell width and margins. You can use the ruler to change the height of rows in the table. When you do so, you’ll see a guide telling you the specific height of the row so you can quickly format it to the specific size you want. You can also use it to control the vertical margins in headers and footers (see more details below). We recently added new controls which let you specify the size of the margins in your header and footer. You can control the margins using the vertical ruler feature highlighted above or by using the interface pictured below. By controlling this spacing, you can make sure your document is formatted just as you want it. 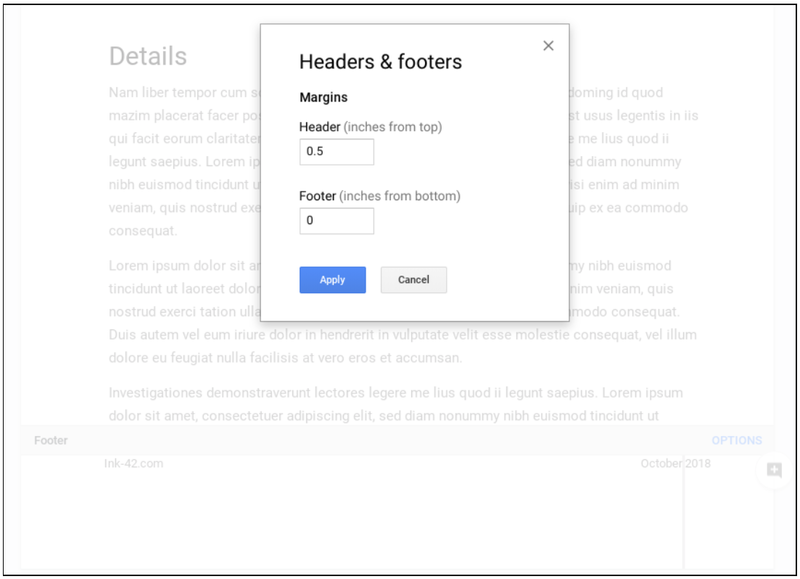 In response to user feedback, we’re adding a vertical ruler in Google Docs on the web that will help you manipulate tables and control the margins in headers and footers. These changes are now starting to take effect. Along with the new role, we’ll also be updating the names of the existing Team Drives membership roles. This post contains more details on what to look for and what to expect as these changes roll out. For Rapid Release domains, new names for roles in Team Drives will start to roll out on October 10th, 2018. The new role and optional auto-migration will start to roll out on October 15th, 2018. For Scheduled Release domains, new names for roles in Team Drives will start to roll out on October 17th, 2018. The new role will start to roll out on October 22nd, 2018. The optional auto-migration will start on October 29th, 2018. There will also be a new role, “Content manager.” See below for more details. See our Learning Center to see more about roles and permissions in Team Drives. Users with the Content manager role will be able to edit, reorganize, and delete content in a Team Drive, but they won’t be able to modify Team Drive membership or settings. Content manager will replace “Full access” as the default role for new Team Drive members. We recommend that Drive File Stream users also make use of the Content manager role, as it will make it easier to manage Team Drive files through their computer’s file system or the Drive web interface. See our initial announcement for more details on the Content manager role. External users who are members of Team Drives in your organization will not be migrated, unless they belong to a group that also contains internal users. If they belong to a group that also contains internal users and that group is a member of a Team Drive with “Edit access,” the group will be migrated and as a result those external users will have the Content manager role. Note: The window to opt in to the migration has now closed, and we can’t accept any additional migration requests. Google Drive app on Android - use version 2.18.372 or above. Google Drive app on iOS - use version 4.2018.40 or above. Google Drive File Stream - versions 27.1.49.1806 or above on Windows and 27.1.49.2230 or above on OSX. New names for roles in Team Drives will start to roll out on October 10th, 2018. The new role and optional migration will start to roll out on October 15th, 2018. New names for roles in Team Drives will start to roll out on October 17th, 2018. The new role will start to roll out on October 22nd, 2018. The optional migration will start to roll out on October 29th, 2018. Role management in Team Drives is available to G Suite Business, Enterprise, Education, Nonprofit, and Enterprise for Education editions only. G Suite Basic users can create and access Team Drives if they’re invited by a user or organization that has Team Drives (see details), so users may see their role change. In September, we told you that a new “Content manager” role was coming soon to Team Drives. We also provided an optional role migration to help organizations take full advantage of the new role. See details of that announcement here. the deprecation of the Email Settings API in the Admin SDK and encouraged people to use the Gmail API instead. This is a reminder that we’re planning to turn down the Email Settings API on October 16, 2019, at which point any requests to the API will fail. We recommend using the Gmail API, which has replacements for most Email Settings API endpoints. This includes the ability to manage Gmail delegate settings, which just launched earlier this month. Please note that the Web Clips and General Settings features don’t have replacements in the Gmail API; a replacement for the Language Settings feature is planned for Q1 2019. 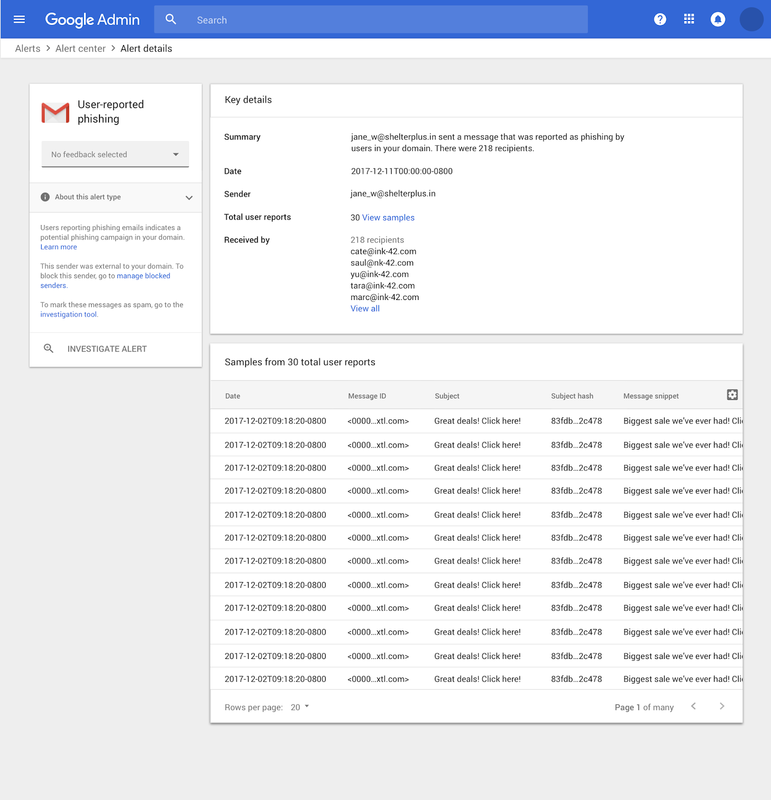 If you haven’t done so already, we suggest migrating to the Gmail API as soon as possible. You can use this guide to help you transition. In 2016, we announced the deprecation of the Email Settings API in the Admin SDK and encouraged people to use the Gmail API instead. This is a reminder that we’re planning to turn down the Email Settings API on October 16, 2019, at which point any requests to the API will fail. and helps G Suite organizations detect threats and take action to mitigate them. The alert center brings together alerts on some of the most critical security concerns including account warnings, gmail phishing and malware, and device management. These alerts cover a number of scenarios. Account warning alerts: These will cover seven different scenarios, ranging from suspended accounts triggered due to suspicious activities to alerts on government-backed attacks. Gmail phishing and malware alerts: We leverage machine learning to identify threat indicators and uncover malware threats. We surface alerts for potentially malicious IP addresses, even if these are placed on your trusted whitelist. We’ll also show potential phishing events, including those messages that have been quarantined or delivered. Device management alerts: We look the various device attributes to determine if user device has been jailbroken or rooted. These alerts are surfaced, along with other device management alerts on suspicious device activity. 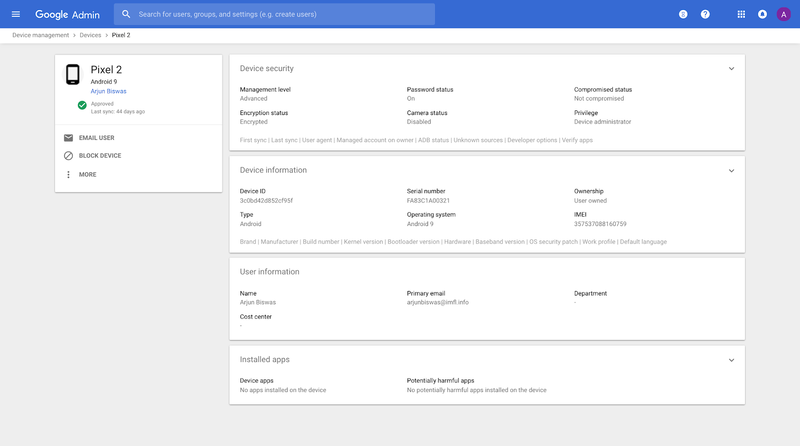 Google operations alerts: The Google operations alert provides details about security and privacy issues that are affecting your organization's G Suite services. For every alert, we include dedicated knowledge articles to help admins learn about the alert type. Where relevant, we also have links that admins can use to take actions to help remediate the threat. Links to these resources are accessible from the alert detail page within the Admin console. They can help admins take action right away to shield users and remediate incidents. The unified view that the alert center provides will help all G Suite admins manage alerts more efficiently, and provide insights that help them assess their organization's exposure to security issues at the domain and user levels. In addition, G Suite Enterprise edition domains can use the G Suite security center for integrated remediation of issues surfaced by alerts. From every alert in the alert center, admins at G Suite Enterprise domains will have a dedicated link that will trigger a pre-configured query in the investigation tool. This helps these admins go from detection to remediation with just a few clicks. 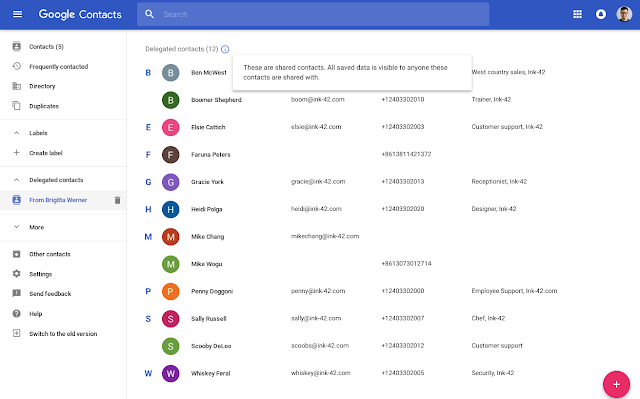 We’re making the alert center for G Suite generally available. 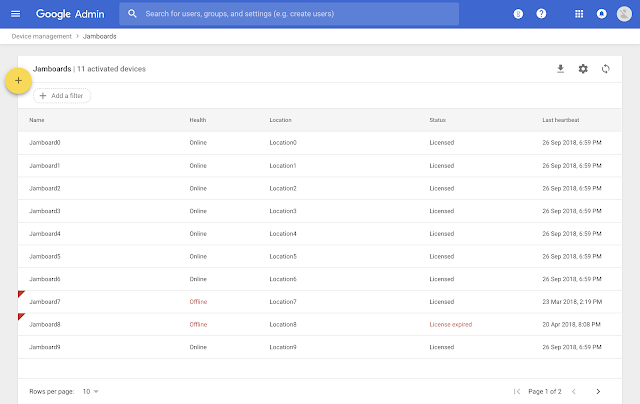 The alert center provides a single, comprehensive view of essential security-related notifications, alerts, and actions across G Suite. 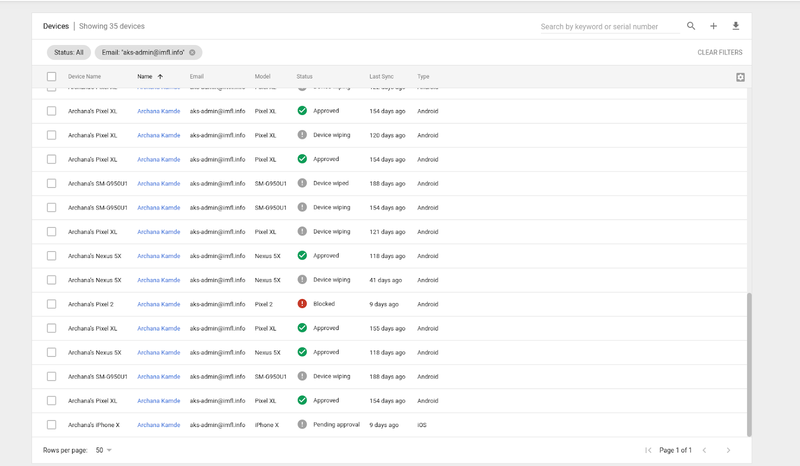 The alert center was previously available in beta and helps G Suite organizations detect threats and take action to mitigate them. Visit the Help Center for more information on how to use Explore in Google Docs and Slides. The Explore feature in Google Docs and Slides makes it simple to search for Google Drive files related to whatever you’re currently working on. 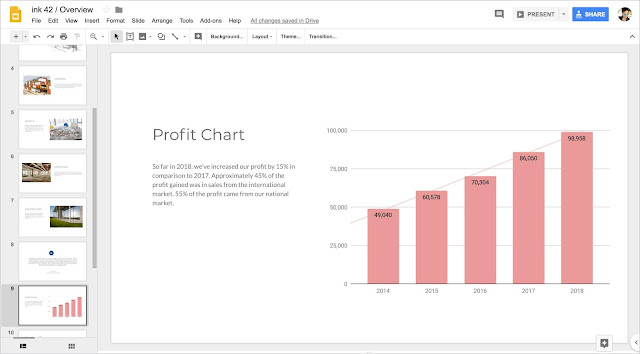 With this launch, G Suite Basic, Business, and Enterprise users can view images and charts in those files—right from within the Explore panel—and insert them quickly and easily into their document or presentation. code to sign in to your G Suite account, you can tap a prompt that Google sends to your phone. This prompt is an easier and even more secure way of authenticating your account, and it respects mobile policies enforced on G Suite employee devices. Until now, in order to receive Google prompts on a new device, you had to explicitly approve that phone when you first signed in with your G Suite account. With this launch, however, you can opt to get Google prompts on all of your devices automatically. 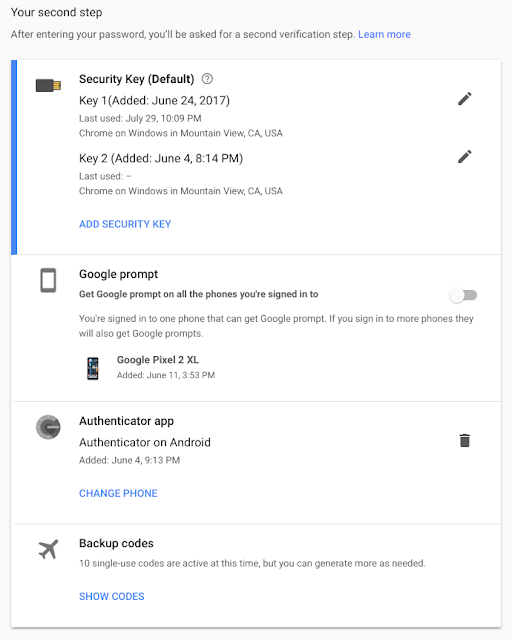 To get Google sign-in prompts on all of your phones, visit the 2-Step Verification page in My Account. Instead of using a 2-Step Verification code to sign in to your G Suite account, you can tap a prompt that Google sends to your phone. 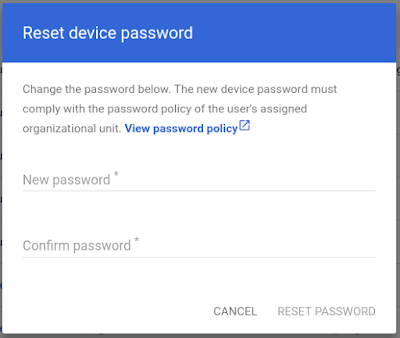 This prompt is an easier and even more secure way of authenticating your account, and it respects mobile policies enforced on G Suite employee devices.
. This move creates a more consistent and intuitive resource management experience for G Suite admins. This replaces the Jamboard Admin console, but all of its functionality to provision, deprovision, and see device health is still available and all of its settings will be preserved. We’ve also added new features like filtering for improved searching, pagination, and a refresh button. Visit the Help Center for more information on viewing, modifying, and updating settings for your Jamboard in the Jamboard Admin console. You can now manage your Jamboards, along with your users and other devices, all in one place. We’re moving Jamboard fleet management and administration into the Admin console under Device Management > Jamboards. This move creates a more consistent and intuitive resource management experience for G Suite admins. If you turn captions on, Google Slides will use the audio from your microphone to automatically create captions of what you say. These captions will display in real time at the bottom of your screen to all audience members watching the presentation. This will work for local presentations and for presentations over video conferencing software, where captions will show on the shared screen. The feature works in U.S. English on Chrome browsers. Captions are created from the presenter’s computer and its microphone, so captions may not work consistently if there are multiple presenters using different computers. You may want to let the audience know that captions are from Google Slides, not the video conferencing software, and that only the speaker's voice is captioned. To find out how to turn on and use automated captions in Slides, visit our Help Center. 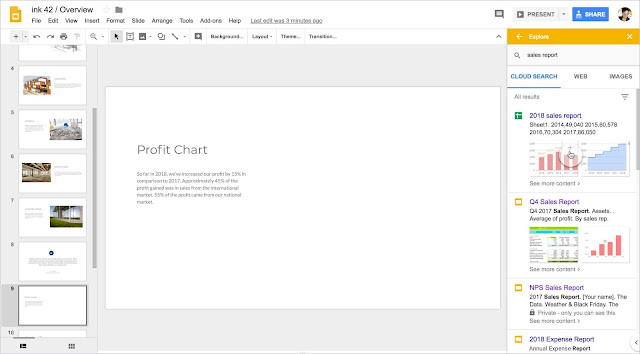 You can now show automated closed captions in real-time when presenting in Google Slides. This feature uses your computer’s microphone to detect your spoken presentation, and then transcribes what you say as captions on the slides you’re presenting. We hope that this will make your presentations more effective in more environments to a wider audience. the option for G Suite admins to receive a security alert if we believed their users were being targeted by a government-backed attack. At the time, admins had to explicitly enable these alerts. We heard that many admins weren’t aware of this alert and so weren’t receiving this critical information. As a result, we’re going to turn these alerts ON for most admins starting October 10th, 2018. Admins will receive a security alert if we believe their users are being targeted by a government-backed attack. You’ll still have the option to turn these alerts OFF by navigating to Reports > Manage alerts > Government-backed attack warning in the Admin console—or you can simply opt out any time you receive an alert email. You can disable these alerts in the Admin console. Note that if you previously enabled and then disabled these alerts, they will remain off. If you’d prefer not to receive these alerts after October 10th, simply turn them on and then off again in the Admin console prior to that date. We won’t override alert preferences that have been explicitly changed prior to October 10th. In August, we launched the option for G Suite admins to receive a security alert if we believed their users were being targeted by a government-backed attack. At the time, admins had to explicitly enable these alerts. We heard that many admins weren’t aware of this alert and so weren’t receiving this critical information. As a result, we’re going to turn these alerts ON for most admins starting October 10th, 2018.
that we’re extending the Gmail API to bring G Suite developers new ways to manage the Gmail delegate settings of users in G Suite. These new features will allow G Suite admins to authorize apps that can then add, view, and delete Gmail delegates within their organizations. Once set up, a Gmail delegate can read, send, and delete messages, as well as view and add contacts, on behalf of another user in their organization. For example, an admin can now use the Gmail API to grant an administrative assistant access to the Gmail of an executive they work with. You can read more about these capabilities in our post on the G Suite blog. We recently announced that we’re extending the Gmail API to bring G Suite developers new ways to manage the Gmail delegate settings of users in G Suite. These new features will allow G Suite admins to authorize apps that can then add, view, and delete Gmail delegates within their organizations. When you create or change an event, Google Calendar asks if you want to notify attendees. This choice will only apply to Google Calendar attendees. Regardless of what notification choice you make, Google Calendar attendees’ events will be kept up to date. We’ll also be making some changes to the Calendar API to support this feature. You can learn more about the new sendUpdates parameter in the Calendar API reference. To make sure all attendees see the most up-to-date event information, we’re changing how Google Calendar communicates event updates to meeting attendees who don’t use Google Calendar. 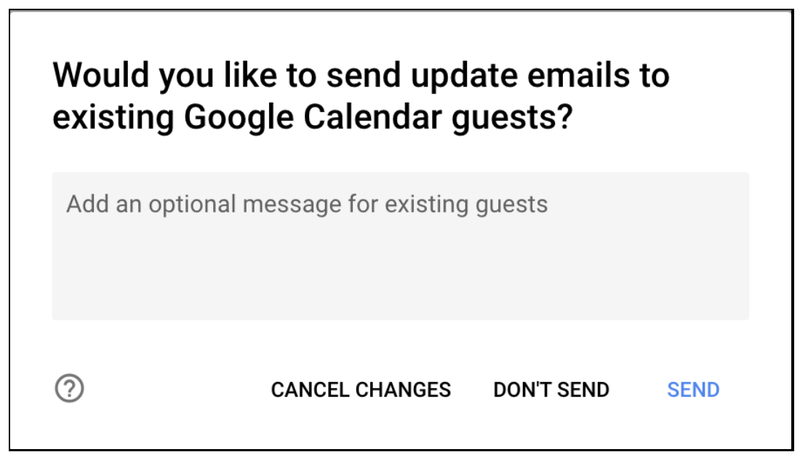 Specifically, users who don’t use Calendar will now always be sent an email when an event is created, updated or deleted in Google Calendar. Previously, some calendar systems would not update these details without an email, meaning event information was sometimes outdated. This feature has been widely requested by customers to help keep event details up to date for all users. Check out the latest "What's New in G Suite" launch recap (pdf) for a roundup of all G Suite launches from September 2018.
enabled can already take actions to protect the data on their users’ mobile devices. For example, they can require devices to have screen locks and wipe devices when they’re lost or stolen. With this launch, we’re giving admins additional capabilities—they can now remotely reset the password on a company-owned Android device or lock the device entirely. If a user forgets their device password, you may want to reset it for them. Check out the Help Center for instructions on how to reset the password on a user’s device. If a user loses their device, you may want to lock it until it’s found. This will force users to enter the device’s password before using it. Check out the Help Center for more info on locking user devices. Please note that the reset password and lock functions can only be used in domains that have advanced mobile management enabled. G Suite admins in domains with Google Mobile Management enabled can already take actions to protect the data on their users’ mobile devices. For example, they can require devices to have screen locks and wipe devices when they’re lost or stolen. With this launch, we’re giving admins additional capabilities—they can now remotely reset the password on a company-owned Android device or lock the device entirely. Filter by several categories (e.g. user name, last sync date, compromised devices, etc. ), and save the URL to apply the same filters later. Search by keyword or serial number. 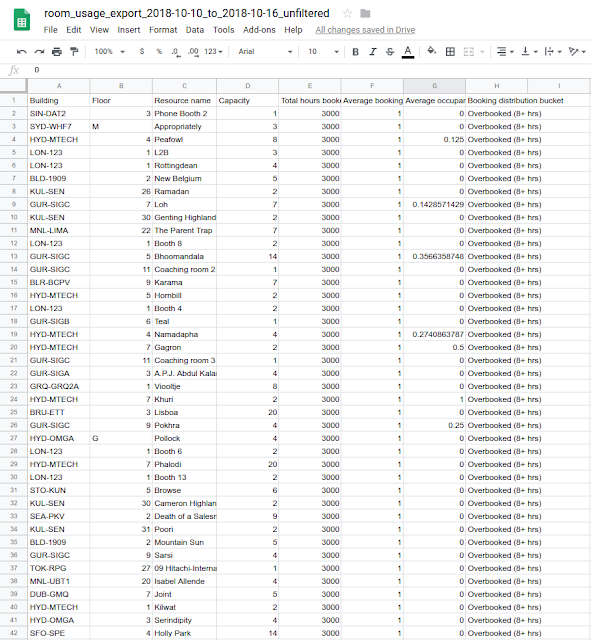 Add and remove columns, and increase the number of rows shown per page. Download selected columns, export them to Google Sheets, and view the progress of that task. 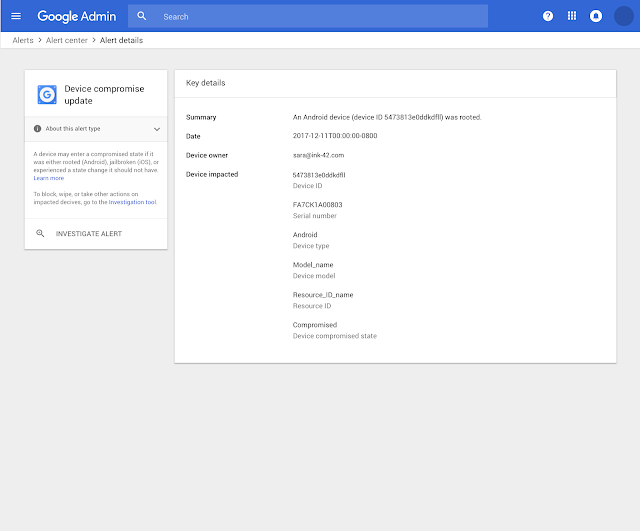 Take action on multiple devices at once and directly from the device details page. The mobile device list now shows all assigned mobile devices (both company-owned and personal) in one view. Block, wipe, or delete the device or account. See all of the apps installed on that device, and identify those that may be harmful. Email the device’s user directly. Learn if a device isn’t compliant and why. Visit the Help Center to learn more about the new and improved mobile devices list, and the ways it can help you manage mobile devices in your organization. 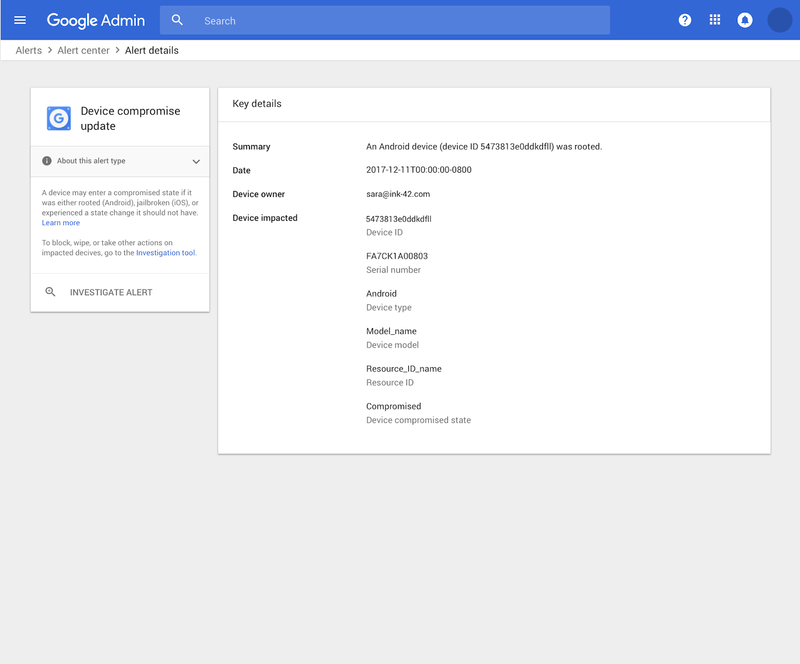 As a G Suite admin, it’s important that you can easily view and obtain critical information about the mobile devices your organization manages. That’s why we’re making those details easier to find and utilize with our updated mobile device list in the Admin console. (version 3.04) won’t support mobile devices running iOS version 8.0 or lower. If your organization has advanced mobile device management (MDM) enabled, your users must upgrade to iOS version 9.0 or higher to access new MDM features or if they need to download the Device Policy app for the first time. We’re planning to release version 3.04 of the Device Policy app as early as next week. Please encourage your users to upgrade their iOS devices as soon as possible to avoid any disruption to their work. The next release of the Google Device Policy app (version 3.04) won’t support mobile devices running iOS version 8.0 or lower. If your organization has advanced mobile device management (MDM) enabled, your users must upgrade to iOS version 9.0 or higher to access new MDM features or if they need to download the Device Policy app for the first time.